Phonics Game for Words with the Vowel Consonant Blends ALL, ALK, OLD, OLT, and OLL improves your child's reading skills. Kids learn to read while they have fun playing familiar games they already know and love. Games include Memory, Go Fish, Old Maid, and War. While playing any of these games using this special deck of cards, children learn how to read Words with the Vowel Consonant Blends ALL, ALK, OLD, OLT, and OLL. Teachers, parents, and tutors use the Phonics Game for Words Ending in ALL, ALK, OLD, OLT, and OLL , designed by Linda Silbert, PhD and Al Silbert, EdD, to help kids develop reading and writing skills. And to improve focus and self-esteem. This Phonics Game integrates with the Orton-Gillingham method and with the Wilson and other phonics programs used in many school districts to teach reading. Get the Phonics Game for Words with the Vowel Consonant Blends ALL, ALK, OLD, OLT, and OLL for Your Kids Today. Not sure what kind of phonics help your child needs? Parents, download the Phonics Checklist to help identify the specific letter or combination of letters that your child needs to master. It's free. Teachers, order sets of 25 of the "Phonics Checklist" for your classroom. 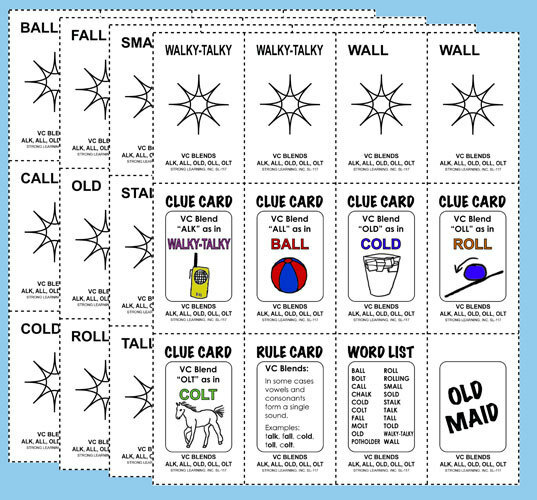 Rule Card: Vowel Consonant Blends rule for words with ALL, ALK, OLD, OLT, and OLL, with examples. VC BLEND "ANG" as in SANG.